The NHL kicked off its season last night with three great games. Winnipeg took down Edmonton 5 to 4, Chicago defeated Washington 6 to 4, and Toronto beat Montreal 4 to 3. There was a very scary moment last night involving one of my all time favorite players. During a fight with Colton Orr George Parros lost his balance and slammed his face into the ice. 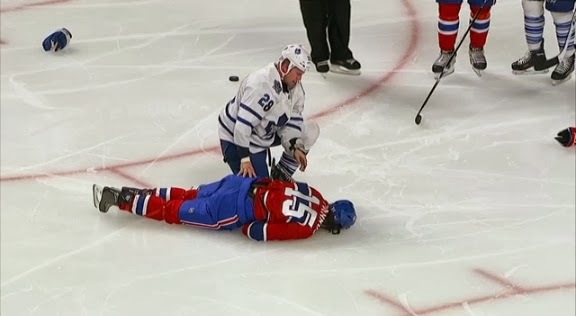 Colton Orr immediately called for medical assistance, which is what you want to see in this kind of situation. Medical staff rushed to the ice and after a tense 10 minutes George was taken off of the ice. George was alert and conscious before leaving that arena but has been diagnosed with a concussion. We here at That F’ing Monkey wish George a quick recovery. Hockey is more fun when the Violent Gentleman is on the ice.